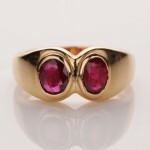 A unique ring consisting of two fine rubies oval cut set in gold. This is a very fine and appropriate ring for natives with Lagna of Leo, Cancer, Scorpio, Aries & Sagittarius towards enhancement of their health, vision, imagination, stability, defence from any crisis, flow of income, wealth, assets, savings, power in your speech, profession, career, status, prestige, honour, rise in luck, prosperity, creativity, wisdom, common sense, political status, authority, power. This ring is especially powerful for natives who are working in a court, inland revenue, diplomat, governing office & have a leadership position. Try this and you will discover the justification of our slogan ”Discover the Difference”!